I’m going to complain about the weather for a micro-second. I’m sorry. But it’s just been sooooo hot and humid here lately. I can’t stand it anymore. I’m tired of feeling like a sweaty mess. My friend and I went to an outdoor party at Smuttynose Brewing Company on Sunday and I kept asking her the whole time “do I look sweaty”. She assured me that I appeared as cool as a cucumber. But I have my doubts. Please note, in January you totally have my permission to throw this little whiney conversation back in my face. Seriously. I know I deserve it. So needless to say, I’ve used my oven a total of negative one hundred times during the past couple of weeks. Grilling, stovetop meals and cold salads are where it’s at. 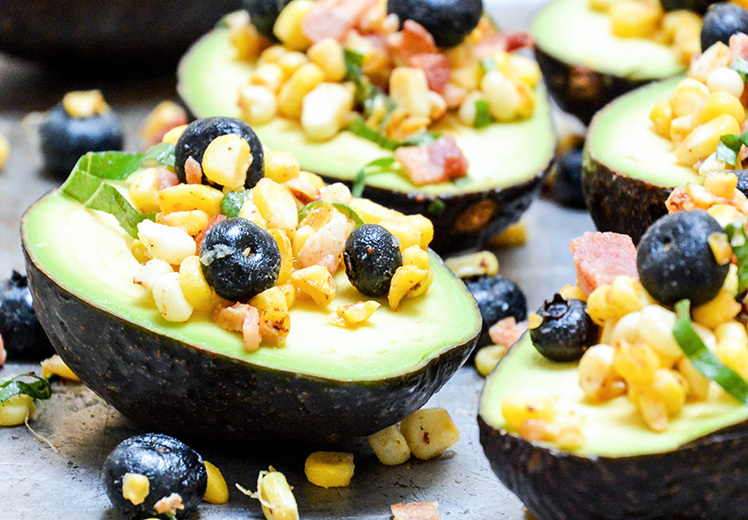 These stuffed Avocados with Bacon, Corn and Blueberry Salsa are totally oven free, which basically makes them the only thing that I want to eat right now. I start by cooking the bacon in a skillet on the stovetop and then – and this is totally the best part – I quickly sauté the corn in the rendered bacon fat until it’s just starting to brown in a few places. Because you know that we can’t waste bacon fat. I think that’s actually illegal in twenty-three states. And blueberries. My mom and I went berry picking the other day (also a very hot and sweaty experience), and now I’m up to my ear-balls in blueberries. So I tossed a few of those in with the corn and bacon for an easy savory-sweet salsa, which I then stuffed into some perfectly ripe avocados. It’s hard to make avocados even better then they already are, but this salsa does a pretty good job. 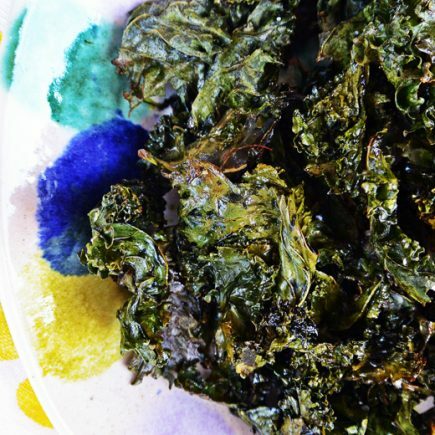 These work great as a party appetizer or side dish. But for me, they are also perfectly acceptable for dinner. With a side of ice cream, that is. Heat a non-stick skillet over medium-high heat. Add the bacon slices and cook about 3-4 minutes per side, or until the bacon is fully cooked and at your desired level of crispness. Remove the bacon from the skillet and set it aside on a paper-towel lined plate. Add the corn kernels to the skillet with the bacon fat and sauté, stirring frequently, until the kernels start to brown in a few places, about 1-2 minutes. Remove the skillet from the heat and transfer the corn to a bowl to cool slightly. Once the bacon is cool enough to handle, chop it into small pieces. Stir the chopped bacon into the sautéed corn along with the blueberries, basil and lime juice. Cut the avocados in half. Remove and discard the seeds. Place the avocado halves flesh side up on a plate or serving tray. If the avocados won’t sit upright, create a flat surface for them to rest on by slicing a small area (about the size of a penny) off the back of each half, being careful not to slice too deeply into the avocado. Sprinkle a little salt on the avocado flesh. Then fill each avocado with a few scoops of the salsa. Serve and enjoy. It has been WAY too hot. Like, I kinda want winter. I KNOW. WORST thing to say! Anyway. I lovelovelove stuffed avocados and with salty sweet bacon and blueberries!? GIMMEGIMME! Pinned! Totally the worst. We are going to regret saying these things in a few months. If you get a walk in cooler, I want to come over and insert myself into it. Is that weird? Wasting bacon fat is a high crime around my house- love that you sauteed the corn in some 😉 I cannot get enough avocados lately, and these babies look like a perfect lunch to me! As a Minnesotan, I can honestly say that despite the heat I am still not looking forward to winter. I am, however, looking forward to making these avocados! NOMS! Yeah, I’m definitely not looking forward to winter either. I don’t know if I can handle another one like we had this past year. Yikes! Oh sister I agree with you, it is too freaking HOT!! And less oven time is welcome around here for sure 🙂 I love these avocado boats..can I call them that?? I can’t imagine how you must be feeling with this heat and being pregnant. I feel for you girl! I know what you mean! We have the heat and almost 100% humidity. These stuffed avocados – LOVE! GAH – the humidity is the worst. I can’t even deal. So much freshness and deliciousness! 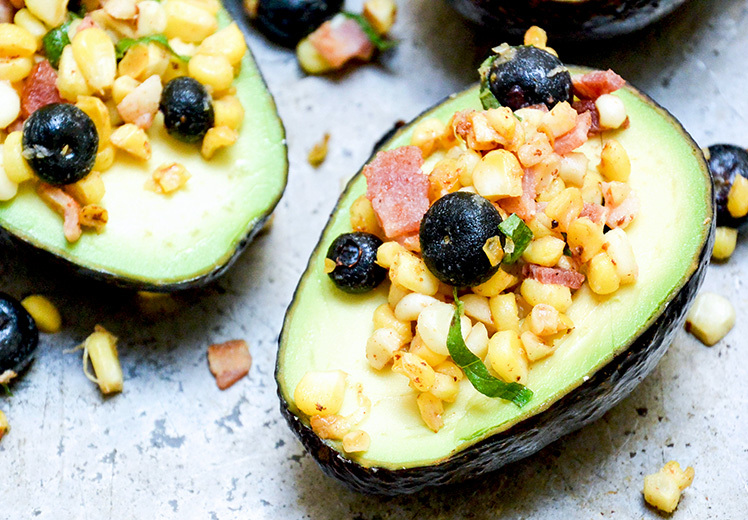 Love the classic avo/corn combo that you’ve brightened up even more with the blueberries! It was sweltering inside my apartment last weekend. Seriously, why do people not believe in ACs in the non-San Francisco parts of the Bay Area? I have been sooo thinking about making stuffed avocados for my Whole30 but haven’t come up with a good combo yet! 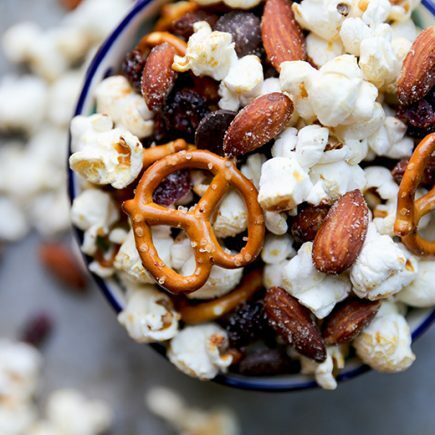 These beauties totally have me craving corn right now! Yeah, go 15 miles outside of the city and it’s sweat-ville. I used to die in the heat of Palo Alto! Girl I TOTALLY hear you with the heat. I feel like I’ve been melting for two months with no sign of relief! But I’m all about savory things with blueberry in them these days (have a savory recipe w/ blueberries coming up soon, mof! ), especially if they involve bacon and avocado!! Love me some savory fruit dishes! Blueberry picking?! So jealous! The closest I get to blueberries off the vine are at our local farmer’s markets… but I guess that will have to do because I need these stuffed avocados in my life pronto! Liz, I love your posts. . you are hilarious, girl! yeah don’t get me started on the weather here . . we have our de-humidifier going full blast. . I never even knew things like this existed until we moved here to WI?! I love these avocados. . LOVE!!!! I put a little balsamic dressing in the center and eat my avocado like that for a quick snack but this. . this is glorious. and these are absolutely acceptable for dinner. Ha ha. De-humidifiers are a staple here in the New England too. Can’t survive without them! I’m totally with you on the hot and humid weather. The humidity this year… can. not. handle. it. I walk outside and it’s instant sweat and instant frizzy hair! A girl can’t win these days with the weather, but this avocado and blueberry salsa is a win-win! Yes, luckily I have straight hair so the frizzy-ness doesn’t get me too much! At least I have that going for me! Hahaha, you know that the hot and sweaty look is every girl’s least fave. But embrace it while you can, right? Kind of… Oh September, this is why you’re my favorite month. Hot and sweaty is just a New England staple. That’s for sure. Ah jeez, I thought it was hot here, but the humidity lends a whole new level to the summer heatwave. It’s super dry over here, which makes the heat a bit more tolerable, so I’m sending little spurts of ice water and AC your way 😀 Love these stuffed avos! Also please send bourbon cocktails. The end. Can I just say I love reading your posts. I need to come over here daily to get my giggle and smile on!! You crack me up. And I guarantee that I would of been a sweaty mess, so I would of kept asking and asking too. But then I would of probably gotten buzzed and who would of cared then, right? 🙂 It’s super hot here in Palm Springs, Ca (like 115 hot) but we don’t have the humidity, so I’m not sure whats worse. But these Stuffed Avocados look ah-mazing! I’m so making these this weekend!! Pinned! PS and aww berries picking. We don’t have that here. Jealous. Happy Weekend!! It’s been nasty hot here too, but I think I would forget about that if I was invited to a party at Smuttynose! You obviously didn’t have enough beer! Good call on the bacon grease fried corn – these avocados look like the perfect dish to beat the heat! It is getting really sticky here too! Anything that needs to be baked I try to squeeze into our little toaster oven. I should just make these instead! 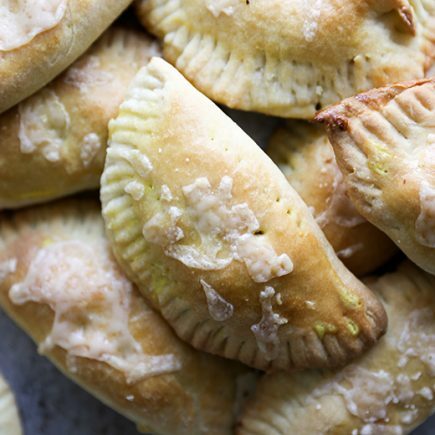 Oh the toaster oven is a great idea, too! I’m going to need to try that!